Once in a while there are those surreal "pinch me" moments in the wedding photography business. I've been lucky enough to know Brad for several years and knew that he had been recently engaged to Becky, who clearly made him the happiest he'd ever been. Fast forward a little bit and I got a phone call asking if I'd fly to Paris to photograph their magical, intimate elopement near Trocadero Square. Um. YES. X1000 more yes'es. PINCH ME. A couple months later we landed in Paris, scouted some locations for the perfect ceremony spot for Brad & Becky, as well as some iconic portrait locations. While we were at the Louvre we got hit with an impressive thunderstorm that kept us huddled underneath the covered areas for a little while. But once the rain cleared we had the courtyard near the Louvre entrance entirely to ourselves, allowing us to capture some absolutely breathtaking frames that most visitors will never get the chance to capture. I am eternally thankful to Brad & Becky for inviting me and my husband along on such an important adventure. I am so honored to have been their choice in photographer and will never forget a single second of the day we spent together roaming Paris while we captured their wedding portraits. Brad & Becky, we love you! This intimate Paris elopement near the Eiffel Tower is still one of my favorite weddings (not to mention destination weddings) ever. Brad & Becky held their ceremony at Bir Hakeim Bridge (which is also the bridge featured in Inception) which has perfect views of the Eiffel Tower without the crowds. 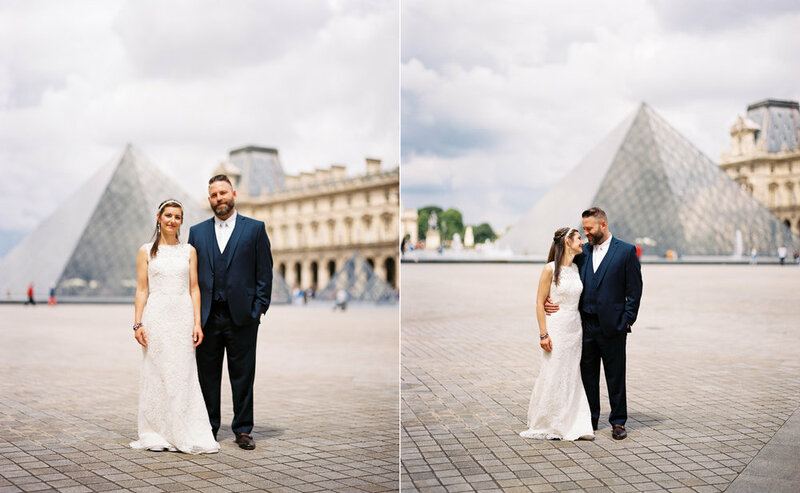 We did additional couples portraits for the newlyweds at Trocadero Square, as well as the Louvre. The Louvre's courtyard is perfect for portrait sessions with all the beautiful architecture and small crowds. Film scans from The Find Lab!